I hardcoded the wraparound function name (ousefulHack), which then got me wondering: is there a safe/trusted/approved way of grabbing arguments out of the URL in Scraperwiki so this could be set via a calling URL? 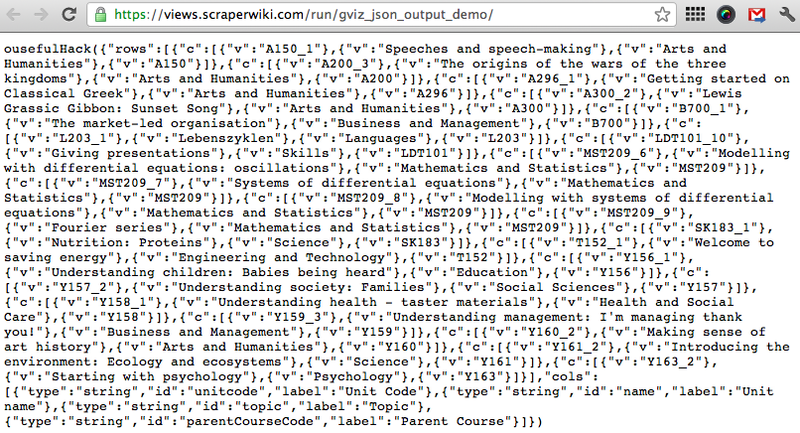 Anyway, what this shows (hopefully) is an easy way of getting data from Scraperwiki into the Google visualisation API data format and then consuming either via a Scraperwiki view using an HTML page template, or publishing it as a Google visualisation API JSONP feed that can be consumed by an arbitrary web page and used direclty to drive Google visualisation API chart widgets. I think google.visualization.Query.setResponse can be a user defined callback function name; maybe worth trying to implement this one day?